When Betty came to life in 1930, women were liberating themselves from constrictive and expensive undergarments such as corsets featuring rigid stays and metal clasps that held their stockings up. The modern, forward-thinking woman of 1930 opted instead for loose bloomers and a ‘garter belt’ or ‘roll garter’ to keep her stockings in place. As dresses got shorter and shorter, the occasional flash of a woman’s garter became a symbol of her status as a liberated woman - a symbol that traditionalists viewed as provocative, even shocking. While Betty’s garter may strike the 21st century sensibility as a charming vintage accessory, for audiences of the 1930s, Betty’s garter sent a very clear message: this is a modern, liberated woman. A woman hides her flask in her garter during Prohibition. 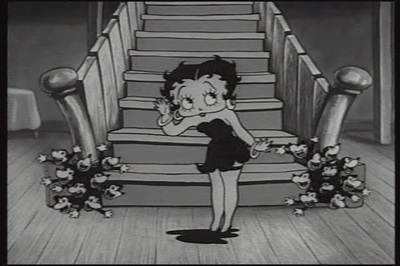 In her very first film, Dizzy Dishes, Betty wears ‘roll garters’ on both legs. ‘Roll garters’ were circular bands of elastic covered with fabric that could be rolled over the top of each stocking to hold it in place. It wasn’t until “Silly Scandels” (Betty’s 7th film) that she transitioned from the mainly functional ‘roll garters’ on both legs to the more sensual, lone garter more commonly associated with Betty. But on which leg did Betty wear her garter? Her left leg… except when she wore it on the right one. 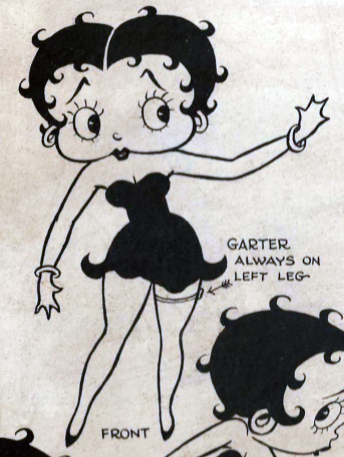 An early model sheet shows Betty's garter clearly on the right leg. 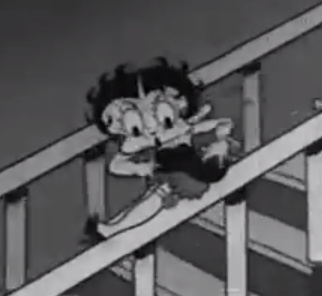 Animators working on these early films used ‘model sheets’ as a guide. These sheets were created to show the characteristics of each character, so that all the animators working on a film would be consistent about how they drew the details of a character. In the case of Betty’s garter, this didn’t always work as planned. 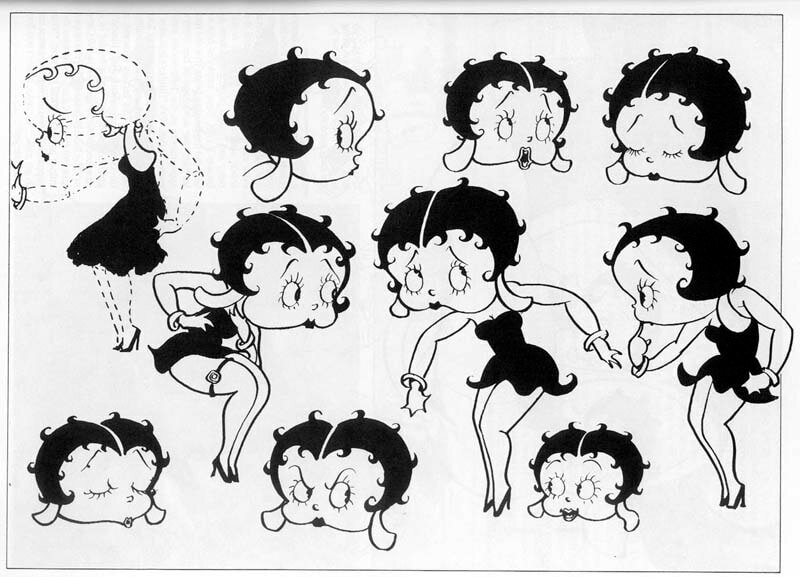 The first drawing on the left is from a very early model sheet of Betty that shows the garter on her right leg. The second drawing, on the right, from a later model sheet clearly shows the garter on her left leg, and includes a reminder to animators that it should always be on the left. 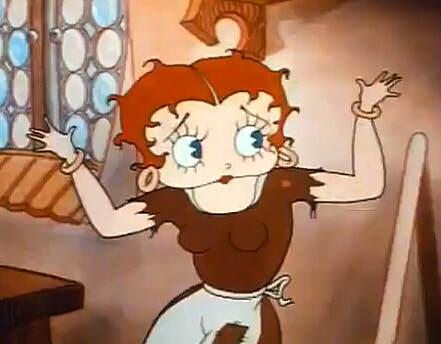 In spite of this… and though Betty’s garter is usually on her left leg…. 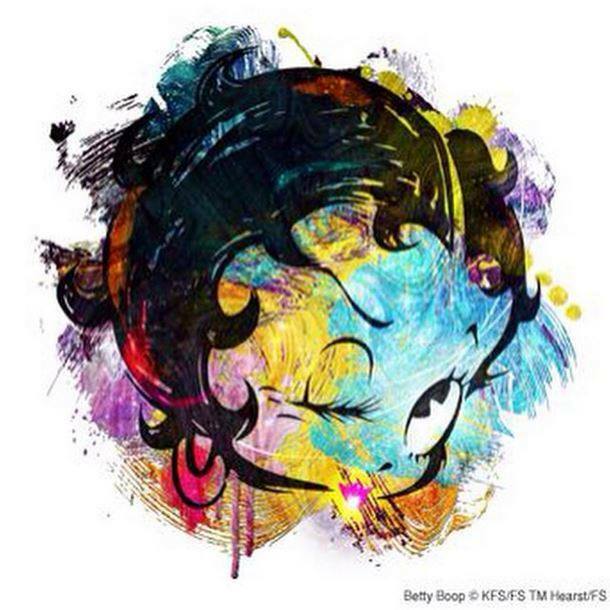 it did sometimes appear on her right leg…. and if you look carefully you’ll even find a few films (like “Minnie the Moocher”) where, at different moments in the same sequence, it sometimes appears to be sometimes on the right leg and sometimes on the left! A later style sheet reminds animators the garter always goes on the left leg. Garter on the right leg. Garter on the left leg. 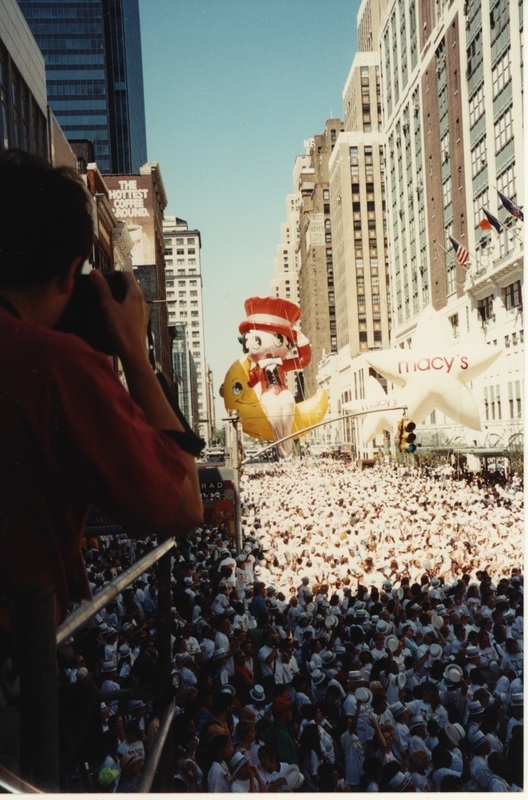 Betty Boop watches over 6500 tap dancers at Macy's 1995 Tap-o-Mania. One of the garters worn by dancers. 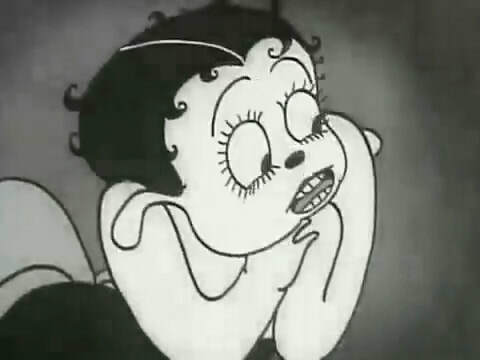 Twenty years ago, on August 20, 1995, Betty Boop served as the official host of Macy’s 17th annual Tap-o-Mania event in New York City. Each year, starting in 1979, the landmark department store would attempt to break the world record for the "largest assembly of tap dancers to dance in a single routine." More than 6,500 tap dancers came together in Herald Square to participate in this exciting and very festive event, officially breaking the previous year's record of 6,252. 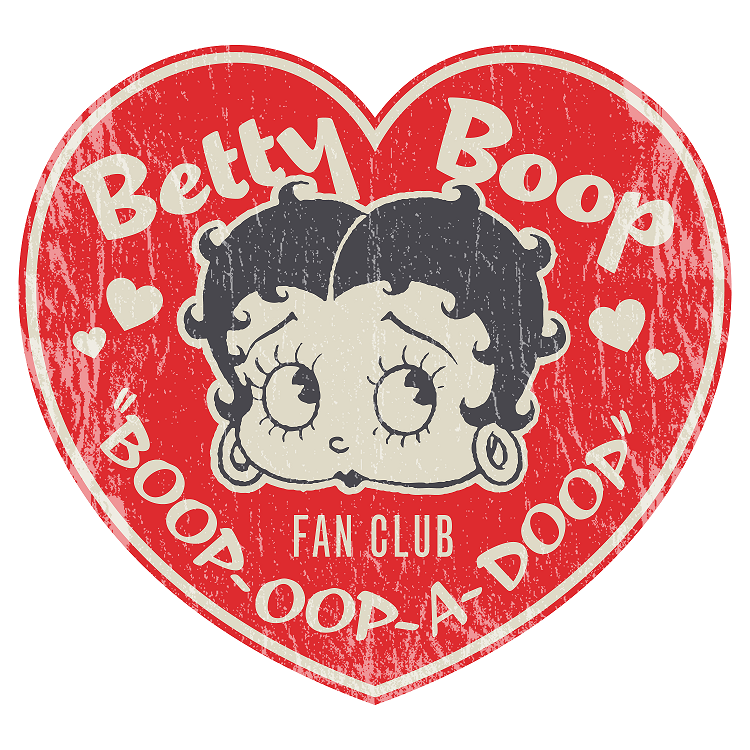 The dancers, who wore Betty Boop t-shirts, hats, and signature garters learned their record-breaking routine from 150 tap coaches and with Betty Boop in the lead, danced themselves into the pages of The Guiness Book of World Records! 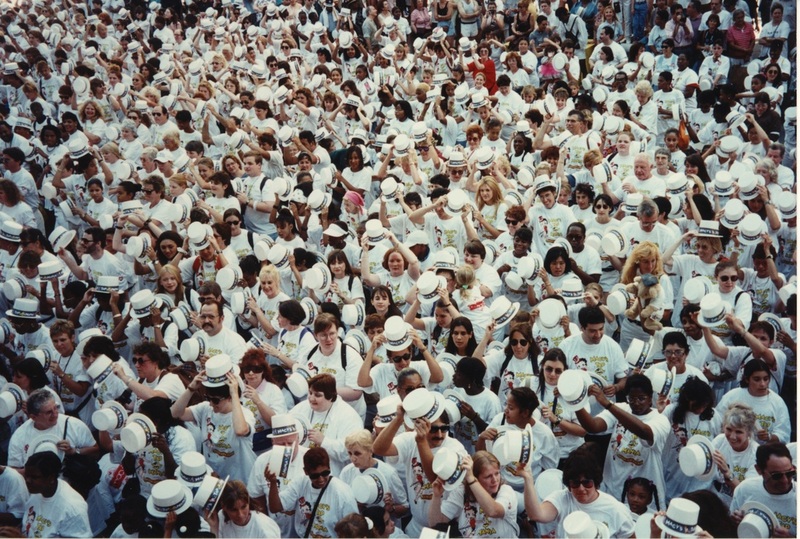 Some of the 6,500 dancers who participated in Macy's record-breaking 1995 Tap-o-Mania. 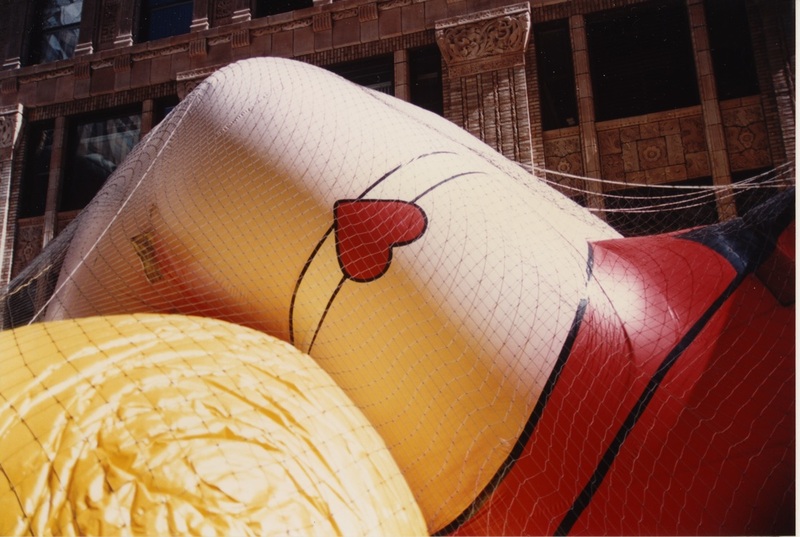 The garter on the left leg of the giant Betty Boop balloon that watched over the dancers.